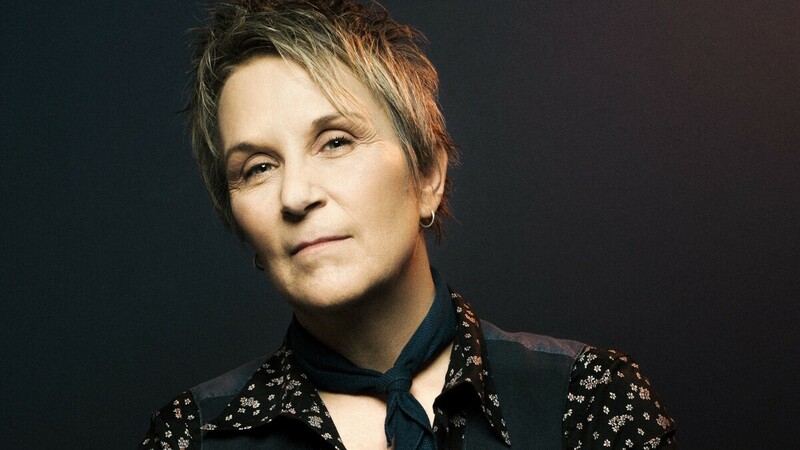 Mary Gauthier Wrote 'The War After The War' With Six Soldiers' Spouses Based on true accounts, the song is a devastating testimony to the quiet suffering of the partners and spouses who welcome soldiers home. Mary Gauthier's Rifles & Rosary Beads comes out Jan. 26. There's a cartoonish perception that it falls to hawkish country singers to take up for the military and to lefty folk singers to protest the very idea of going to war, though there are actually quite a few exceptions to that rule. In four years of volunteering with the nonprofit Songwriting With Soldiers, singer-songwriter Mary Gauthier has been working in an environment where such divisive us-and-them thinking has no place. She and a handful of accomplished songwriter peers have spent numerous weekends holed up with active duty members and their families at secluded retreat centers, collaborating on songs that make tangible the toll of combat. From that body of songs, she's culled 11 vignettes on her arresting new album Rifles & Rosary Beads, including "The War After The War," which NPR is premiering today. It's a devastating testimony to the quiet suffering of the partners and spouses who welcome soldiers home. Gauthier is two decades into a recording career that's earned her respect among fans and fellow practitioners of serious songcraft, but all this time, she's most often turned her unflinching eye on herself: her own processing of abandonment and adoption, youthful rebellion, recovery from addiction and romantic grief. "It's a relief in some ways," she reflects during a Monday morning phone call, "to have stories that I'm so passionate about and really wanna tell, but I'm not pulling them from my own experience anymore. I find that this is every bit as important to me, if not more. I'm in there in a certain way, because the way I tell it, my voice is there. But it's not my story. It's their story told through the filter of my voice." She spoke with NPR about what it's like giving poetic shape to soldiers' soul-baring and why she feels it'll connect across all manner of ideological divides. What comes of being cut off from the outside world for a couple of days in the focused environment of a Songwriting With Soldiers retreat? Fundamentally, our job as songwriters is to sit down and listen. So there will be generally 10 to 15 veterans and four songwriters. We introduce ourselves and we play a little show for 'em the first night, maybe two, three songs each, so they can get a feel for who we are as songwriters. They know who they wanna write with after we play a few songs. The next morning we get up and have breakfast together, and then we go into different parts of the retreat center and sit down with our veteran and we ask them just a few questions and they start talking, and we find really quickly a thread to a song. Because we all need to write at least two songs, usually three songs in two days each, we've gotta roll. We don't have time to piddle around, and that's a really good thing. We listen with intensity, and as soon as they stumble onto something that sounds like a title or a thread, we start to find the music behind that. I can honestly say that within two hours, I can get a song out of what they're saying. And I didn't know I was capable of that. That was one of my big concerns going in, is that I'm slow when I'm writing my own songs. "I Drink" took me two years to write. It seems like soldiers might be reluctant to talk about their combat experiences with people who haven't been there and don't know what it's like. How do you overcome that? You know, I think that's a stereotype. I haven't come up against that once in four-and-a-half years of doing this. Here's the deal: We're not therapists. We're not looking for a diagnosis. We don't talk about politics ever. We don't judge what they've been through at all. What we're honest-to-God trying to do, and they know it, is to get the best possible song that we can from their experience, and it opens them up, because they know they're not being appraised. We create this place that's safe, and they feel it and they start talking and shock themselves with what they say. The old stereotype of "soldiers don't talk" is, I think, [tied to veterans of] World War I, World War II. And of course, Vietnam vets didn't talk because nobody wanted to hear it. They came back and they were despised and belittled for their service. This is a different generation. I was told by the director of the retreat center we worked at last weekend that the new statistics are in around this generation of people who served, meaning the Afghanistan and Iraq conflicts, they scan 55 percent liberal, not conservative. They're young people. They're reflective of what you'd see on a college campus. At couples retreats, I've worked with lesbian couples, married with a child. I've worked with a huge number of couples that the true demographics of American diversity. How else has your perspective changed during this process? What I did learn is that there's a giant civilian-military divide in America. One-half of 1 percent of our population serves. We have so few carrying the burden for so many, and their families carry it too. Getting to know these folks and growing to love them has been transformative for me. The songs on this album articulate complex emotional burdens: survivor's guilt, what it's like to be rendered unrecognizable to yourself by trauma, female soldiers feeling devalued by their male comrades. I love their truth. And their truth in their words is very different. We're not writing about soldiers — we're writing with soldiers. This is their words, for the most part. I may put words in their mouth, but they sign off on whether or not that's what they mean. They get final say on these songs. If it's not right, I want them to tell me so that I can get it right. Look, war is hell. Sending young people to conflicts that are unwinnable and unresolvable — it puts them in a position where they're going to suffer. And yet their experience is that they're proud of their service, and they should be. Service freely rendered is a noble thing. They're not necessarily experienced songwriters or musicians. Could you tell me more about how you let them guide the narrative arcs and tones of these songs? One guy, Jamie Trent, who I wrote "Bullet Holes In The Sky" with, is a songwriter. But none [of the rest] of 'em are songwriters. They don't see themselves as artists at all. You ask them, "What did you see? What did you hear? What did you feel? What did you smell?" You get into the sensations of what it was like, or for the wives, what it's like at home now. And once they start to talk and open up, the songs start to take shape just from what they're saying. You've said that before wading into this project, you really hadn't considered the impact their service has on their partners and families. At what point did you decide you needed to hear from those folks too? That's part of the beauty of Songwriting With Solders. It's in our mission statement as an organization to not only write with the service member, but to include the family. When one member of the family serves, the whole family serves, period. They see the need for this work to help the wives articulate what they're going through. "The War After the War" was a song that immediately grabbed me. You've credited six different spouses as collaborators. How did you distill what they each shared with you into a vantage point that holds together? We guarantee each person that comes to a retreat's gonna get their own song. Once we get that done, then we're moved to do group songs. So this was done in the afternoon on day two. Beth Nielsen Chapman was at this retreat as a songwriter. So Beth and I went to a cabin at the retreat center with all six of the wives that were there. And we asked them so start talking and just say what it's like. As they talked, the narrative developed. I just started writing down everything they said like a stenographer. They feed off of each other's honesty. What Beth and I heard them saying is there's a war after the war, that coming home is not the end of the war. The body holds trauma. So their partners come home oftentimes with deep wounds that the eye can't see, and they're left to deal with that. They don't have the training to deal with that. So they feel like they are part of the war in a way they never anticipated. That leads to the line, "I'm a soldier too, like you, serving something bigger than myself." That line really moves me. It makes me cry, actually. One of the lines that I found the most wrenching was: "I lost myself in the shadow of your honor and your pain / You stare out the window as our dreams go down the drain." It captures an acutely intimate sense of loneliness and alienation. Yeah. It is neither person's fault. Nobody has done anything to betray the other, but one partner has come back wounded, so the relationship gets stuck. We have so many wives going through that right now. We've been in war 17 years. They're living in this frozen world where things are stuck. I can't explain this scientifically, but we learned that telling the truth through song and singing it and being witness to, it helps to move it. We've learned to call it post-traumatic growth. You mentioned that the soldiers have final approval on the songs. How does that work? They're signing off on it as we go. If I get it just a little off, they'll say, "Not that word, but how 'bout this word?" Then I'll play the whole song and I'll read the song back to 'em without the music. Every single word, I'll have them scan it: "Is this what you mean? Is this the best way to say it?" Then we agree that it's done, and we go down to the little room where they set up the remote recording studio and we record it. After the retreat is over, the guy who's done the recording will put a CD together of all the songs that were written, and that CD will be sent to 'em inside of a beautiful book of photographs from the retreat. And then we stay in touch with 'em, a monthly call to see how everybody's doing. It's not just a one-off. An awful lot of people who go through the retreats come back and volunteer to help the next batch coming through. It's really beautiful. I just can't believe how much I love it. So the soldiers and spouses get to take the songs home with them, but it's a different thing to share the songs with the world. Did you have to talk through that? Absolutely. Because these are difficult stories. We needed to make sure that they wanted the world to hear them. The songs are up on the Songwriting With Soldiers website, but this is different, a commercial release. I notified all of them that wanted to do it and they signed off on it, and they're excited to tell their stories. They want their story to be useful to other people who are in the position they were in before they wrote their song, a brain-scrambled place where they just can't make sense of what's going on and there's no words. The song helps focus that into something that can be seen and heard, and in that way creates new possibilities. They wanna give that to other people. These songs have the potential to foster real empathy. I think if people really listened to what our families who serve go through, we could have a realistic discussion of what it means to send young people to war. I think these stories can build a bridge between the left and the right. We agree on this, that these people's service matters and that we need to take great care before we send people into the situation where these types of wounds are going to occur again. This is a conversation we can agree on, I think. Rifles & Rosary Beads comes out Jan. 26 via In The Black / Thirty Tigers.